Villa Chai Light , an octagonal waterfront home in North Sound designed to stand out with its unique shape and design. It’s one of the best well maintained homes in Leverick Bay, this seaside cottage is also a successful short term villa rental and remains in pristine condition. The upper level consists of a spacious living area, a fully equipped kitchen and dining area, two bedrooms, two bathrooms and a wrap around balcony which provides a breathtaking panoramic sea view. Downstairs features a spacious bedroom, bathroom, kitchenette and private terrace. Relax at this enchanted cottage and enjoy non-stop breezes, the lush gardens and comfortable furnishings. Stargaze through the villa's telescope from the expansive deck or watch the day-long mega-yacht parade from the private dock. 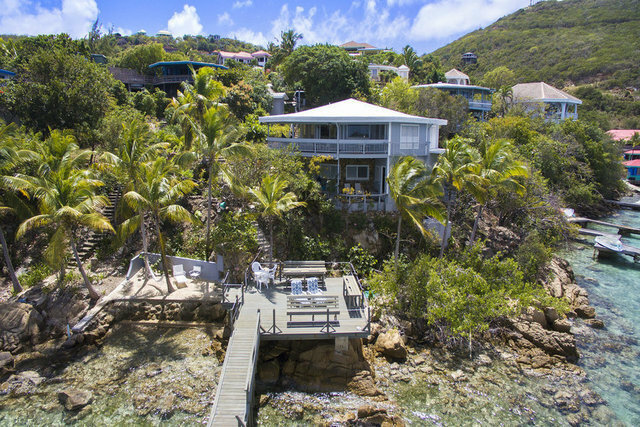 Leverick Bay has traditionally been one of the most popular destinations for yachting, watersports, fishing and/or diving for either year round residents or for vacation villa holiday visitors. Altamira offers a home of peaceful tranquility in a small village with nearby convenient float plane or ferry transportation for ease in exploration to various Caribbean destinations.